Alas, Thanksgiving is over. Our leftovers are nearly finished, and I’m hearing holiday music in the coffee shop and all the stores. We’ve turned the corner. But I hate to leave the turkey behind. I love Thanksgiving, but have decidedly mixed feelings about the more commercial season that follows it, so I’m always a little sad as I wash the dishes after the big meal, a meal that seems so simple, straightforward, and lovely. What could be better than an entire day set aside to eating well and feeling grateful? I’m going to try to keep the spirit of Thanksgiving alive this year by maintaining and expressing gratitude as often as possible during the next few weeks. To that end, I’d like to begin the season with a simple expression of gratitude to my friends and family. Thank you for sharing your time with me~such a rare commodity. Thank you for keeping me in your thoughts. I may not say it often enough, but I’m grateful to you all. So, here’s a poem to inaugurate my season of gratitude. talking of holidays and the sea. I grew up eating cranberry sauce only once or twice a year. In fact, I thought it was available in stores only during the holidays so when I discovered that it could be purchased and eaten year-round, I became a bit of a cranberry sauce fanatic, eating it nearly every day for a couple of years. Ocean Spray, of course. But then I encountered the cheery little berries in their pre-gelled state and tried out the extremely simple recipe on the side of the bag. There was no going back. Over the years, I’ve adapted the recipe a bit, but the sauce is still ridiculously easy to make and truly festive. It’s the perfect astringent accompaniment to the carb-fest that is the traditional Thanksgiving meal. It also provides a bit of a color on the plate, a small jewel among all that beige food. 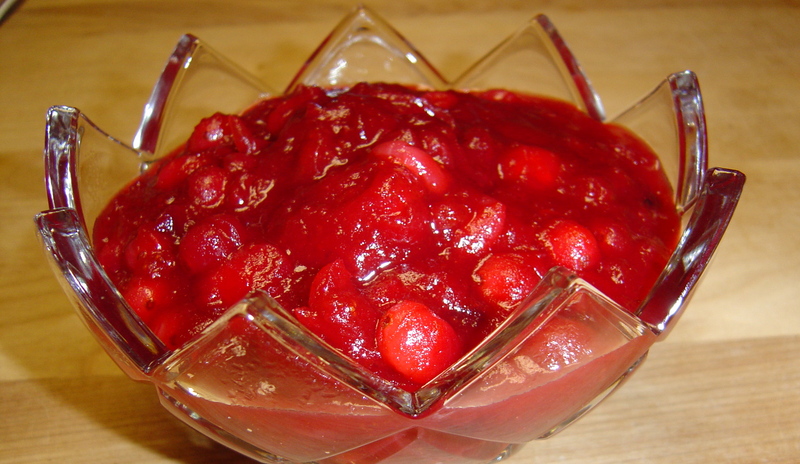 This cranberry sauce is highly addictive, if I may say so myself. It’s my favorite part of the holiday meal, the only part of it that I cannot imagine changing or leaving off of the menu. I’m not sure how much of the alcohol cooks out of the sauce, so I try to limit Mimi’s consumption, for obvious reasons. She’s none too happy about it and who can blame her? Still, a little bit is better than none. Bring the orange juice, sugar, cinnamon stick, and salt to a boil in a large, heavy sauce pan. Add the cranberries and simmer on medium heat for five minutes, stirring occasionally. The cranberries will pop and thicken the sauce. Test for thickness. If you prefer a thicker sauce, let it simmer for an additional five minutes or so. Remove from heat. Add the orange peel and Grand Marnier. Stir and allow to cool. Transfer to a covered class container and continue to cool. Refrigerate for up to three days. We’ll be celebrating Thanksgiving at home this year with our friends Jeff and Karen. I expect it to be a fun but busy week, filled with oven-cleaning (an annual tradition), grocery shopping, and cooking. I’m posting the proposed menu now, in case things get too hectic. Most of these recipes come from the November issue of Bon Appetit. One exception is the cranberry sauce, which is my absolute favorite part of the Thanksgiving meal. I’ll post more about it later in the week.